There’s just something about a well-groomed patio area that makes a house feel like a real home. Depending on where you live, a patio area is an important part of your home since you will no doubt be spending plenty of time out there enjoying the scenery. 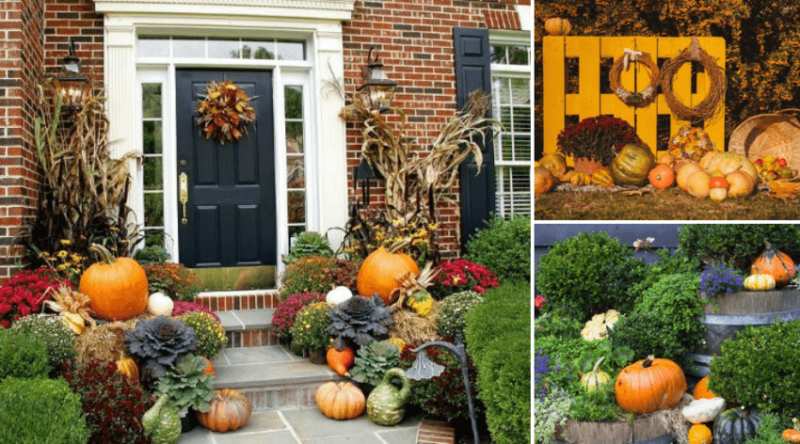 The more spruced up, the better the area will feel and the more likely you are to spend time outdoors with family and friends. 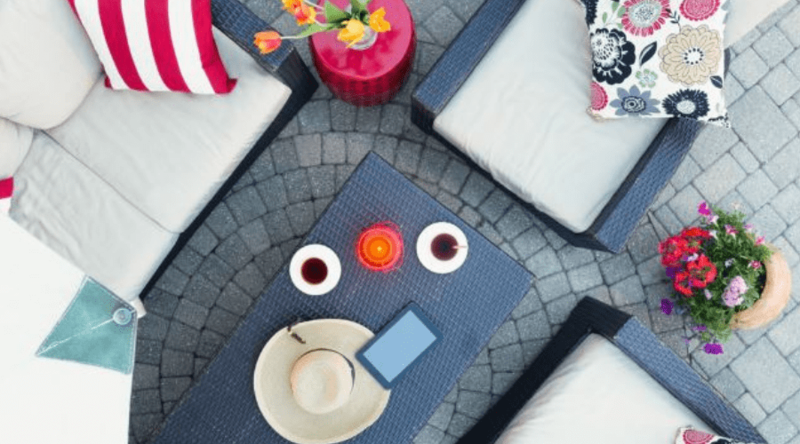 No matter the space of your outdoor area, a patio area is a great way to add some stylish features to an outdoor space while being relatively easy to produce. 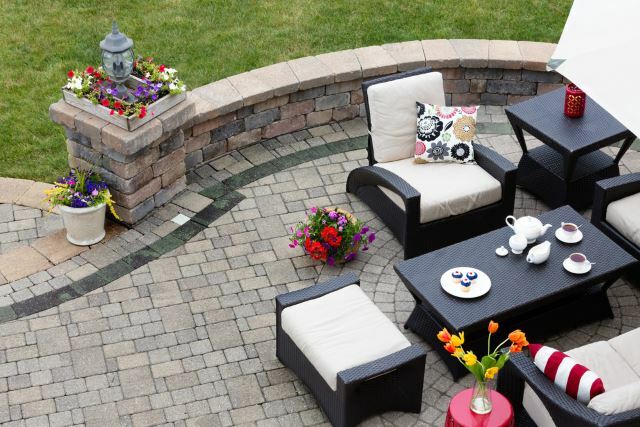 We’ve compiled a few of the best brick patio ideas we could find to make you and your family happy with being outdoors. Pick and choose which elements you like best and create your own unique space or just stick with one of these already fabulous ideas to make your house feel more like a home! Check out this gorgeous stonework! Not only does the tiled patio look fabulous on its own, but the stone masonry throughout this patio adds so much style and flair to the scene. You can easily incorporate various textures, colors and tones throughout a brick patio design, you just need to decide which colors or style you want to go for, first. 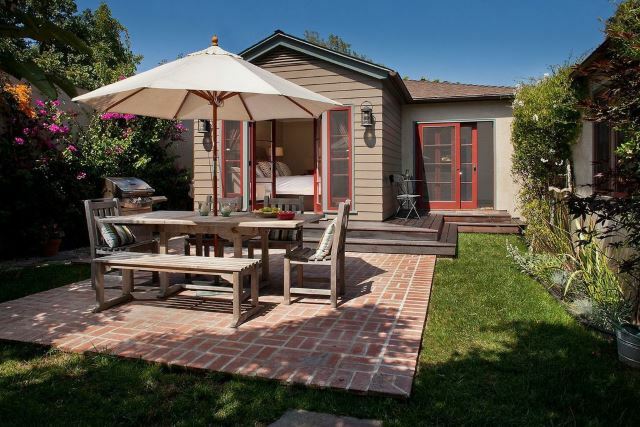 This is the perfect scene for an outdoor barbecue with friends, neighbors and family. You can’t beat the classic look of red paved bricks. 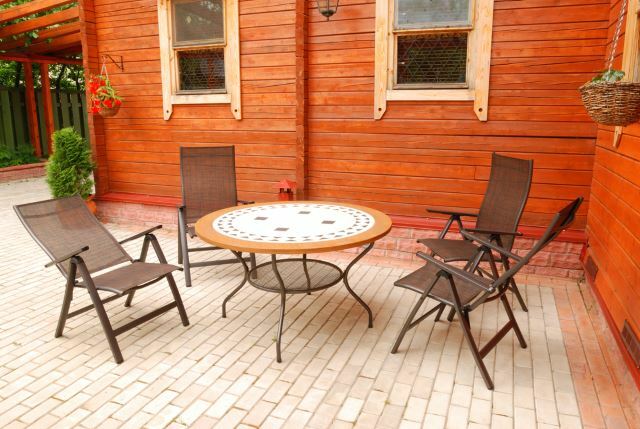 You can easily create intricate designs and find almost any type of patio furniture to match. 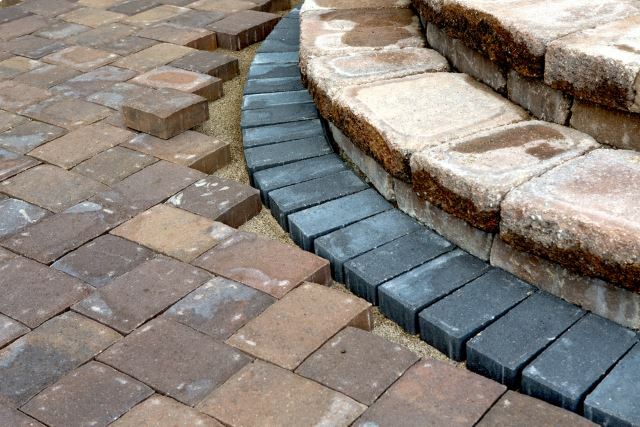 If you prefer a graveled look, you could easily space the paver bricks slightly apart from each other to fill in the gaps with tiny pebbles, grout or even stained glass – get creative with it! Having a red brick paved path will create a classic and contemporary look no matter where the trail ends. Create that interesting depth of perception by adding some brick steps that lead into your patio area. Brick steps are an easy way to incorporate more color and texture into an already existing brick theme or a great way to just add brick embellishments to an outdoor space if you aren’t utilizing brick to begin with. A tiered, flat min staircase like the one depicted creates a contemporary space that is easy to maintain, but looks like it was difficult to install! If you have a lot of space to fill or ground to cover, utilizing the space with bricks is an easy and fast way to cover a lot of ground! The bigger the space, the more polished it looks as the bricks (such as the ones depicted) can give the whole area a very clean and modern look. You don’t necessarily have to cover the entire space with tile, just the patio area where you plan on setting up patio furniture and décor. 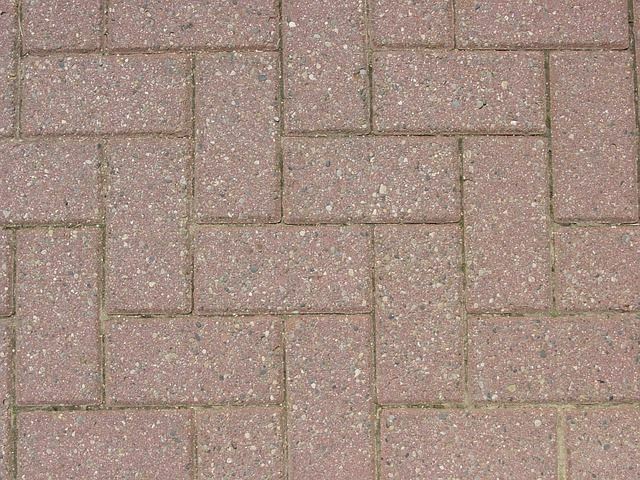 Aside from providing a polished and clean look, you can use bricks that have interesting texture like these to give your patio area an interesting depth perspective. You can choose from such a huge variety of colors that you can pretty much make your patio space any color scheme you want. Brick is just classy, whether used as a standalone or incorporated into something else like cement and/or porcelain tiles. If you’ve got the perfect patio set you’ve been wanting to set up, odds are you’d want the brick to match if it isn’t already existent. 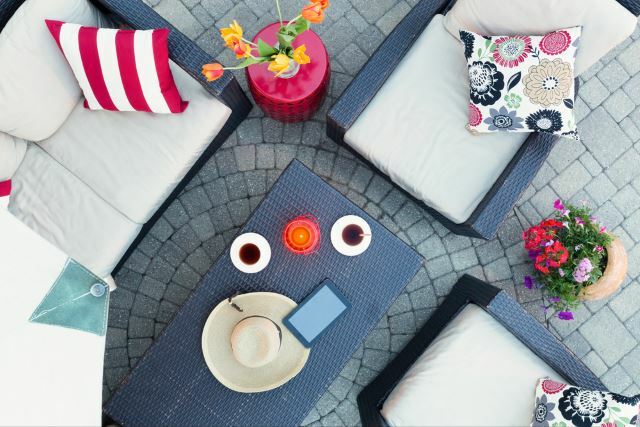 There’s nothing wrong with planning an area around your patio furniture as long as you have the resources and time to plan. With a bit of strategy, any patio area will look that much better and organized. Since patio furniture is a bit trickier to adhere to specific tastes, it may even be a better idea to search for patio furniture first. 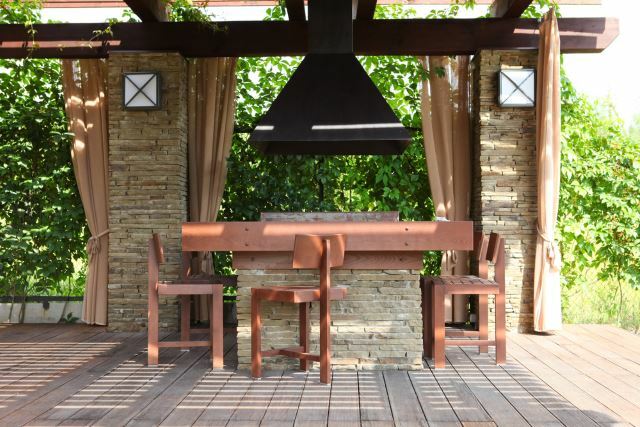 This outdoor kitchen is a thing worthy of magazines. A centerfold spread, even. 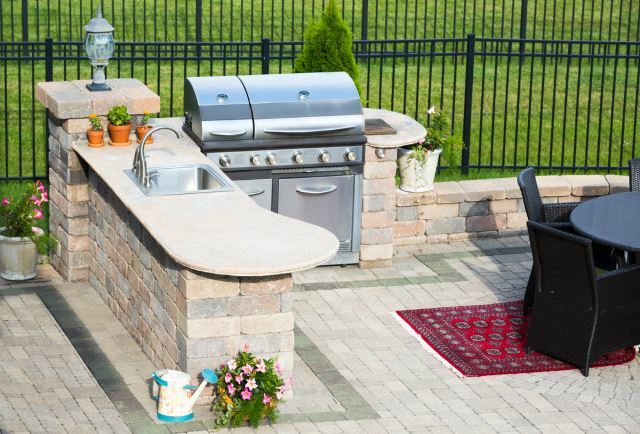 It is the perfect setup as far as outdoor kitchens go. 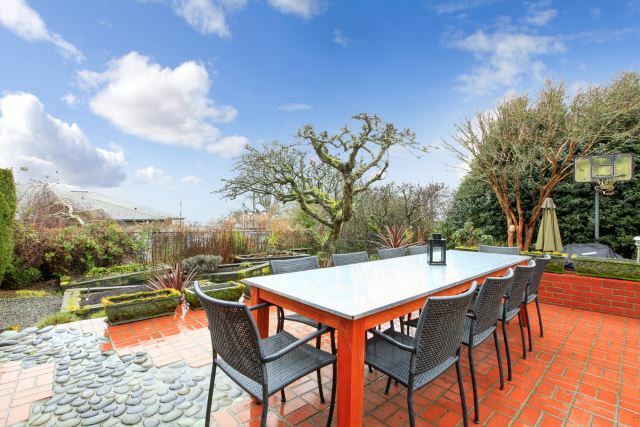 This cozy scene has got it all – a beautiful patio set, an impressive outdoor cooking setup complete with a barbecue pit and some adorable potted plants spread about. This would be the ideal setup for an outdoor gathering or birthday party. 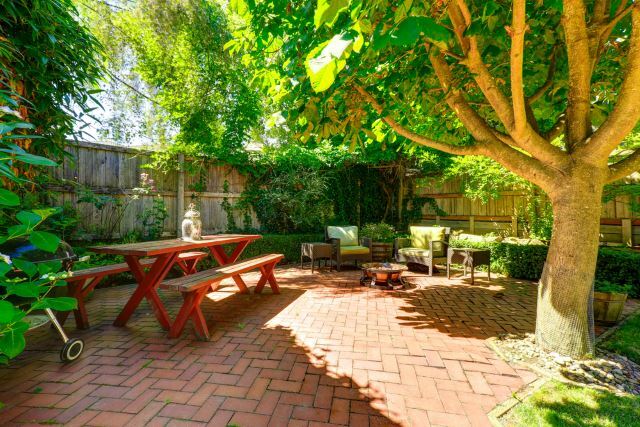 With so much space around the patio, there’s plenty of room for kids and/or dogs to play. This gorgeous outdoor patio area not only looks impressive as a standalone, but that massive stone fireplace really sets the tone for comfort. Imagine a cold, blustery night in front of that giant fireplace taking in the warmth and sipping hot chocolate? This looks like something you’d find at a fancy ski lodge or a hotel up in the mountains somewhere. 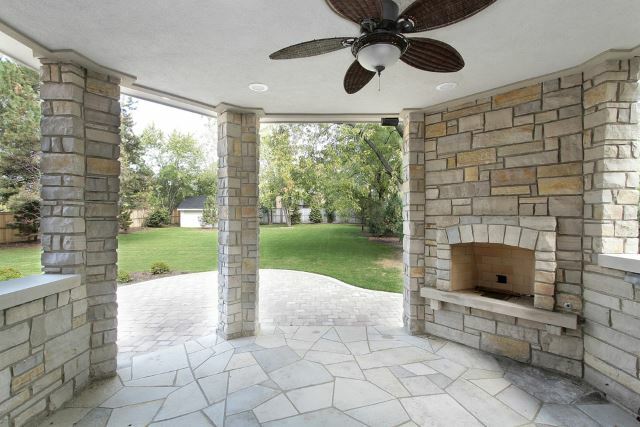 If you have the space, you should definitely look into incorporating a stone fireplace into your brick patio idea. 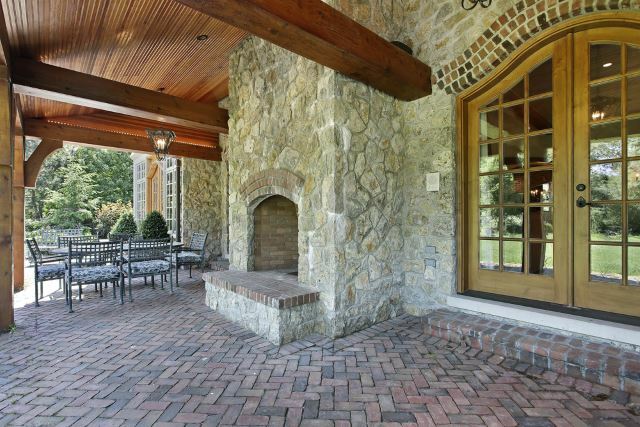 You don’t have to go all grandiose or elegant when it comes to utilizing a brick patio idea. Sometimes simple is just better and you don’t have to put too much work into a brick patio to make it look good. That’s what’s so great about using brick to begin with, it basically sets the tone for itself. 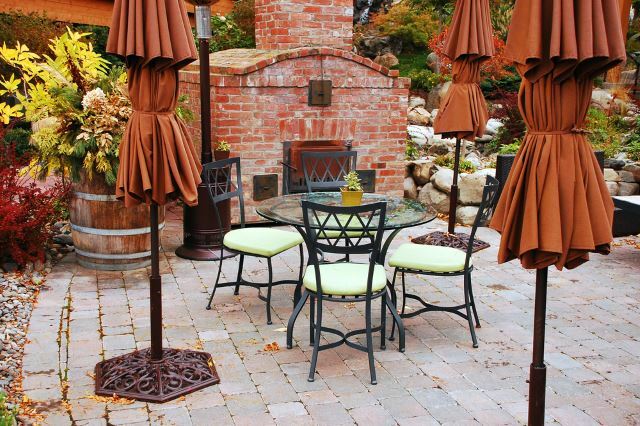 This simple patio idea is inset with brick flooring and some cute patio furniture is placed throughout the scene. Simple, elegant and very affordable. 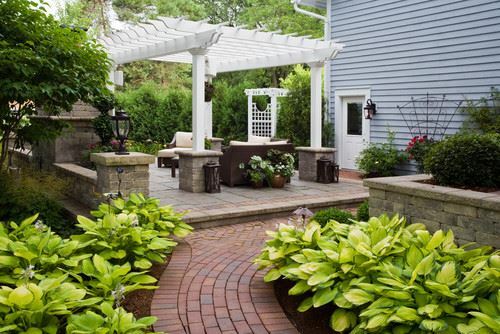 Here’s a good example on what your outdoor space may look like while planning out your patio. 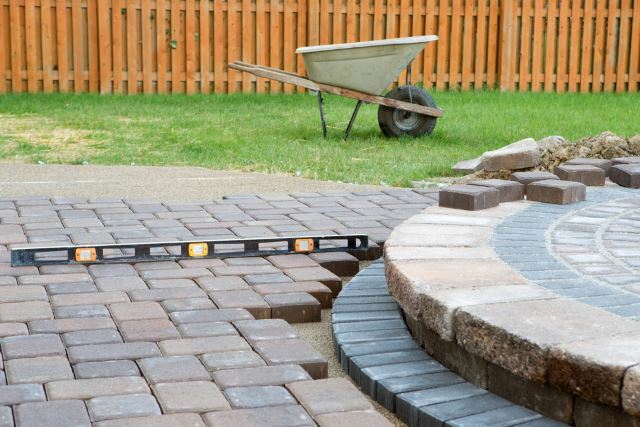 Since the ground is often uneven, a leveller is needed to make sure the bricks are being placed evenly and flatly. If you don’t check for this beforehand, especially in a hilly or mountainous area, the potential to get a shoe or boot stuck on a brick is high and you could put your guests, family and friends and risk. Proper planning is essential when working with bricks. This picture embodies a modern day patio. The intricate brick design below the furniture is simple, but because of its interesting spiral shape, adds so much to the scene compared to just regular inset brick work. The patio furniture is perfect for this particular setup and the beauty of this kind of décor is that it doesn’t really matter what the size of the area that you’re working with is. You can easily scale down or scale up depending on your needs. Here’s a simpler brick patio setup with a fireplace that is much more affordable than that last stone fireplace we looked at. 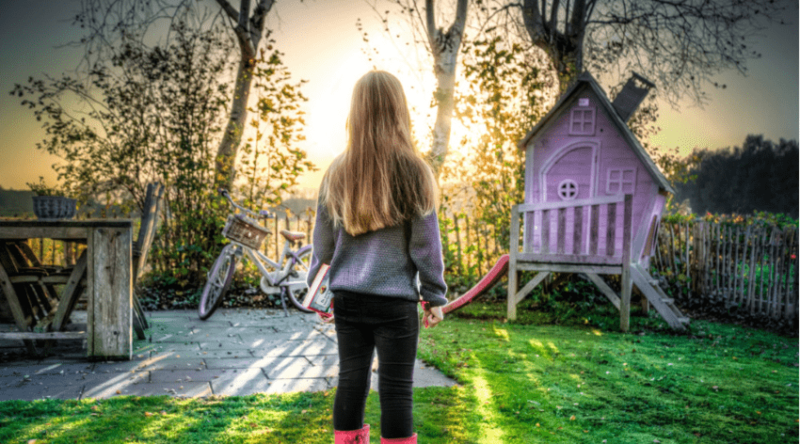 This resembles more of a common backyard scene you’d find in the suburbs or in the outskirts of town. If you have the space, turning your patio area into an outdoor living room is a great way to keep guests outside to enjoy the cooler weather and keep your house clean! It also just looks super great. Taking advantage of a covered patio area would only be to your advantage. 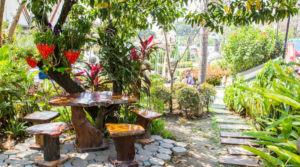 You have a space you can enjoy outdoors despite high sun or rain, your patio furniture or delicate potted plants remain safe from the elements and it just looks fantastic. Using the same color scheme, this scene brings paved brick work and brick walls together to create a true outdoor masterpiece. Again, it doesn’t matter the size of the space since you can easily scale this down if need be. You don’t have to make the entire outdoor area brick. In this setup, bricks are used for the front part of the yard while interesting landscaping complete with a variety of plants snakes around the brick. Incorporating greenery and brick is a great way to keep a patio area while not completely intruding into the natural scenery. A setup like this offers all the comforts of a patio area while maintaining that outdoor beauty. Again, a lot of work and planning has to go into a patio area before seeing the project through. 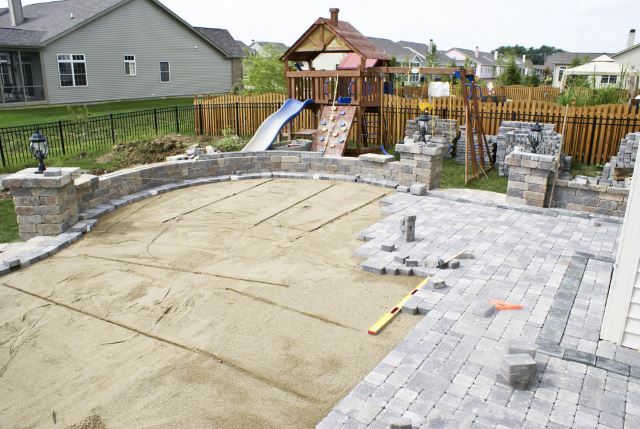 Furniture, playsets and other outdoor areas need to be moved, ground needs to be leveled and depending on what you plan on paving with, cement is sometimes needed to be placed down before anything else is done. Placing cement under a brick patio is a safe way of preventing grass or weeds from popping up from in between the bricks. You just can’t go wrong with red brick. While not prominently a deep red, this type of red brick almost looks like adobe. It’s a bit washed out, but that subdued red color is pretty sought after when it comes to paving an outdoor area. The red is subtle enough to not take anything away from the scenery or natural foliage while making the area look clean and polished. 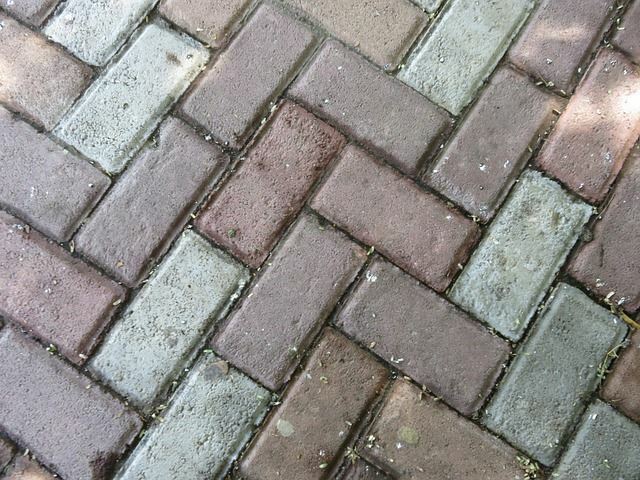 This is a common type of garden brick that you could easily find at most home improvement stores or garden centers. This is a great setup if you like to entertain outdoors. The covered patio area has a permanent table and chair setup that is not only adorable, but highly functional. The brick table will withstand the elements and looks great matching the scenery. What appears to be a massive light fixture hangs above the table, giving it a modern look with added usefulness. This would be a great setup for an outdoor lunch or barbecue with friends. 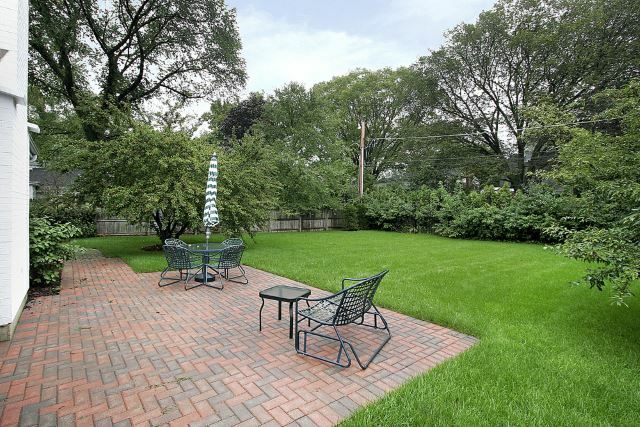 This yard is very large and is able to have a patio area with a large expanse of lawn in the background. You don’t want to get rid of that natural green grass completely if you don’t have to. 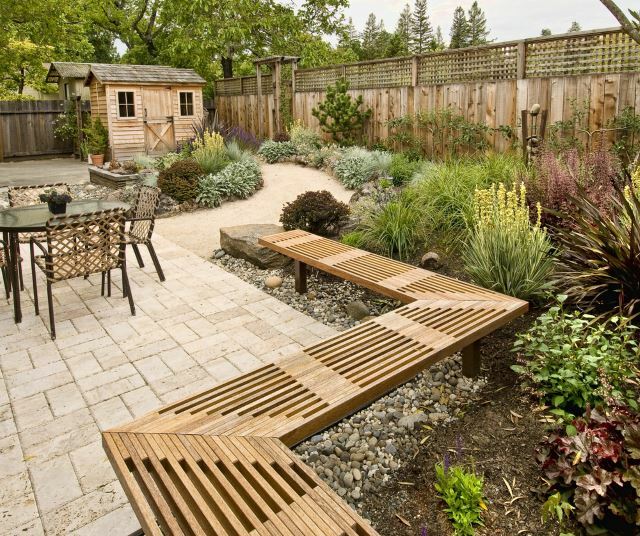 Natural plants and turf look great when paired up with brick work, so if you can, leave some of the grass in place. Especially if you have pets – you wouldn’t want to get rid of that natural turf completely as it isn’t natural for a dog or cat not to have grass. This is the type of scene you’d probably see out in the wilderness in a cabin or lodge. The natural wood in the background indicates that this is probably a heavily wooded area and requires that type of patio furniture to match. The brick is a classy way to get rid of just plain dirt flooring and gives you room to add some interesting elements to match the scenery. The chairs give this scene a more modern look that would no doubt make any passerby want to sit and take in the scenery for a while. This patio is extra interesting due to the use of colored bricks in this scene. 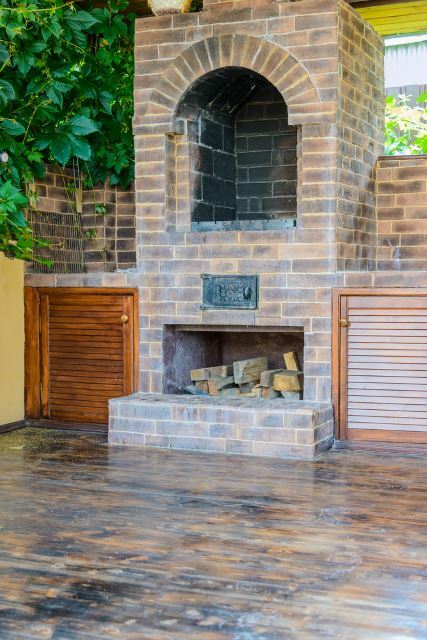 Your eyes immediately go to that impressive outdoor stove made entirely of that classic red and white style brick which matches perfectly to the classic brick flooring. What makes this scene especially great is all the fabulous patio furniture and of course, the very impressive umbrellas that line the sides of the table. This would be a great outdoor setup for enjoying brunch on the patio. Don’t let the use of colors intimidate you. Using bold color elements such as this prominent green color in this setup is a great way to play around with your outdoor scene and change it up from the norm. Although natural brick is a great compliment to an outdoor scene like this, that doesn’t mean you have to keep it so traditional. The adorable green picket fence in the back of the scenery gives way to an equally pleasant patio area that anyone would appreciate. Bring all the comforts and luxury of your home to the outdoors with this fancy patio setup. You’ve pretty much got everything in one here. You’ve got what appears to be a sitting room or outdoor barbecue setup in that little house in the background, a hot tub in the corner and a fabulous patio furniture set with equally gorgeous brick paving beneath it. Who would want to leave this kind of setup? It’s elegant, comfy and still luxurious. There are restaurants that brag about having a brick oven used for cooking pizzas and flatbreads. 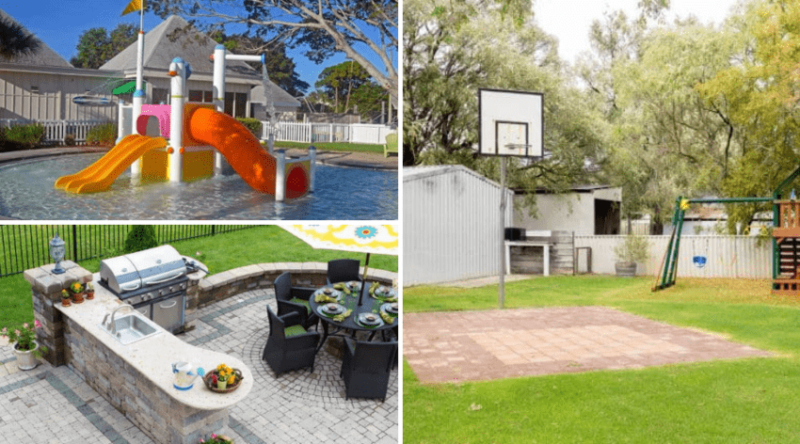 Imagine having your very own in your backyard? 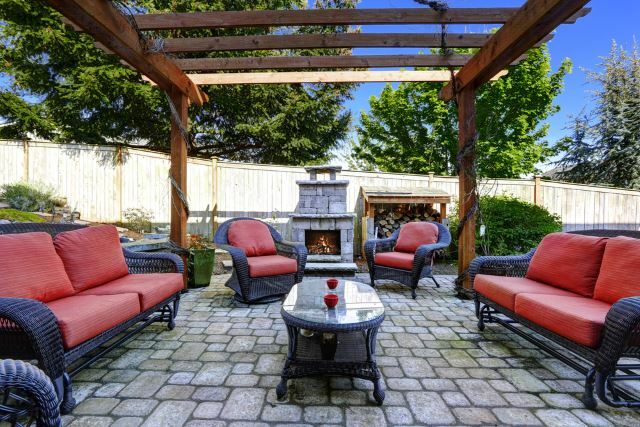 With this patio setup, you can expect plenty of pizza parties and outdoor meals in your future. This is a great, fun setup that still maintains class and elegance. The brick used for the oven is simple, but the color and design is what makes this scene look so interesting. 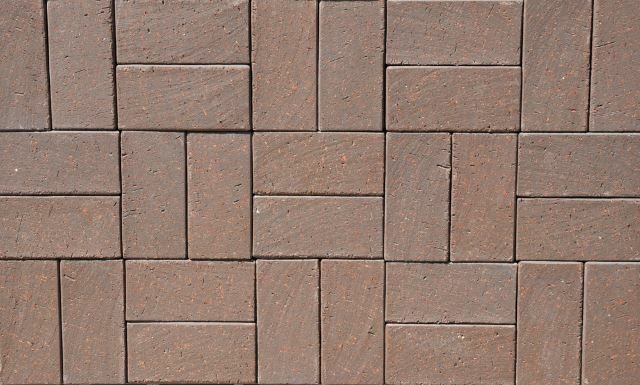 This chocolate brown brick would be perfect for a modern outdoor patio area with a great patio set. I’m envisioning a black or wrought iron patio set complete with matching wrought iron chairs with colorful outdoor cushions. Smooth in texture, this is the type of brick you can really style an outdoor area with. It brings all the beauty and versatility of brick work with an extra layer of style that can be used in any space – large or small. 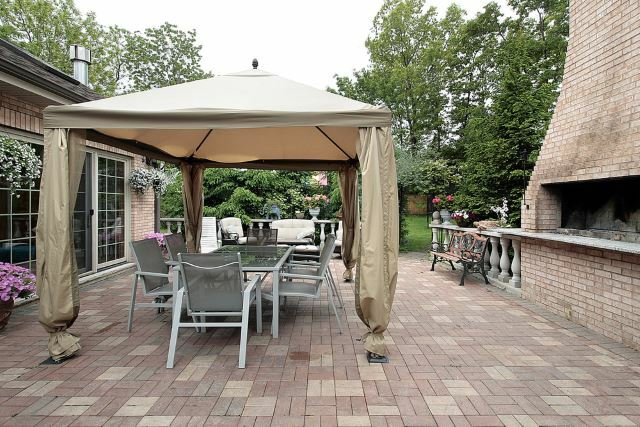 If you don’t have a covered brick patio, you can easily create one with the use of a gazebo or canopy. Just because it isn’t already a fixture off your house doesn’t make it any less easy to obtain. Covered gazebo areas look great atop a bricked patio area and gives off a sleek and stylish look without too much hassle. Of course, you could get as intricate as you wanted with the setup, but the style is relatively simple. It’s the elements you add that will amp it up. Adding an interesting pop of color to a brick setup such as this deep blue brick is a fun way to incorporate some color into a scene without distracting from the setup. Subdued deep colors such as this color of brick add some intrigue and look great as almost every setup. This is an example on how to start building brick work and adding this type of brick into the mix. Whether it’s this great blue color or whichever color you prefer, the finished product with no doubt be gorgeous. 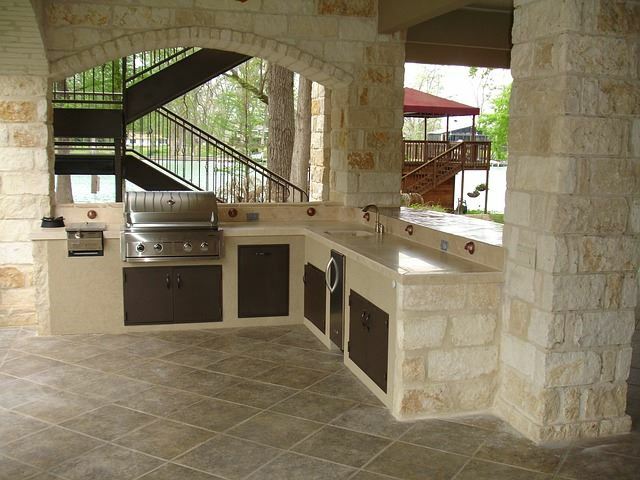 This is such an adorable outdoor kitchen patio design idea. Everything about it just looks cute, comfortable and playful. Mixing intricate brick work with playful pops of color like the color featured on the patio chairs and placemats is a fun way to mix up a design. You could use your favorite color and make a scene like this truly unique and exactly to your specifications. It’d be the perfect place for late morning weekend breakfasts. The simplicity of the brick work in this photo only gives the surrounding elements more depth. This scene is the ideal setup for weekend barbecues or outdoor dinners with friends. The wooden, old fashioned long table in the scene is reminiscent of simpler times when people had more time to get together and eat outdoors. The brick is gorgeous while not intrusive. Add a few backyard string lights and you’ve got the perfect outdoor hangout. These thin, intricately patterned bricks are unique and artistic. This would be the perfect brick concept in a patio studio or an outdoor covered garden area. The inset design adds depth and texture to the area and will no doubt be an eye catcher. 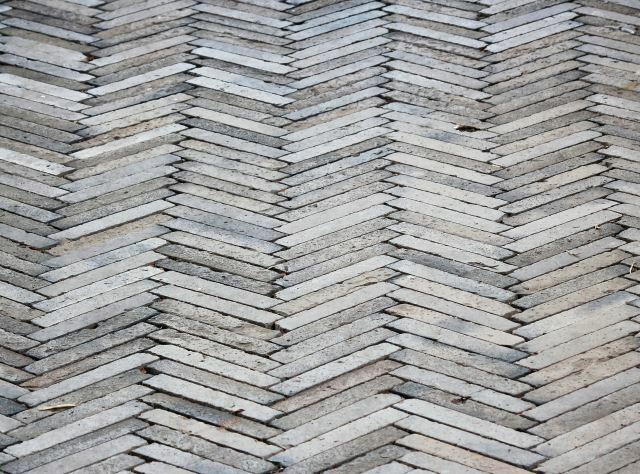 Laying brick like this would be time consuming, but considering how gorgeous it is, it’d be totally worth it. The neutral lighter and darker greys look great as a standalone, but again, incorporating some color is never a bad idea. These orange bricks are arranged in an intricate style while giving off that classic brick look. 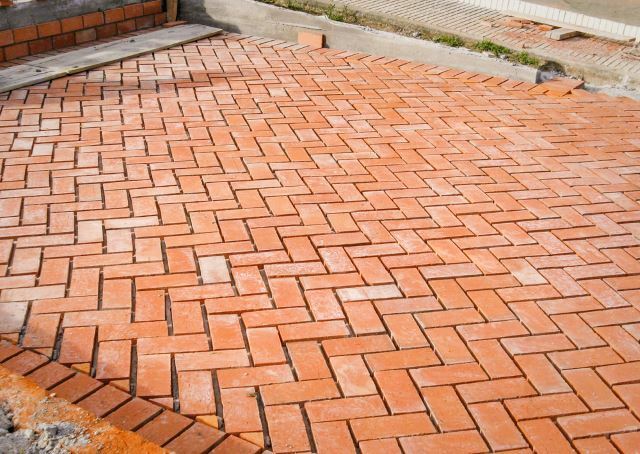 If you don’t want to incorporate too many design elements into brick work, creating an intricate design set is a good way to spruce up an old patio area. Adding fresh brick with an interesting design is very affordable and just looks great no matter the area you’re trying to cover. Pair this with a great patio set and you’re set. 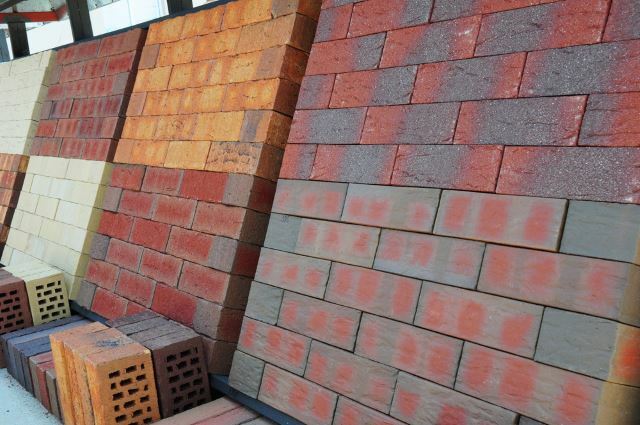 Although the brick palettes in this photo show only your traditional rectangle cut bricks, you can easily take all these color schemes into consideration for any kind of other brick cut you’re looking into. 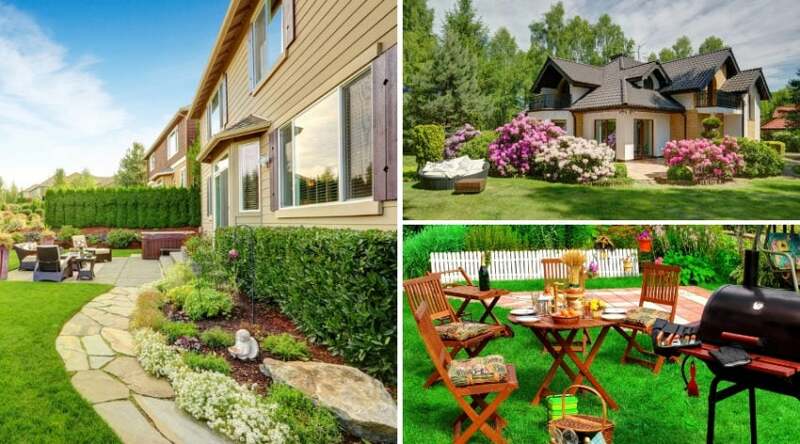 These are just a few examples of the types of color schemes you can look at when it comes to actually going to a store and picking out a brick color scheme for your outdoor patio area. The way they are mixed and matched is truly beautiful and unique. If you’ve ever hired a professional to help design your ideal house, room or backyard area, you’re familiar with these types of 3D renderings. 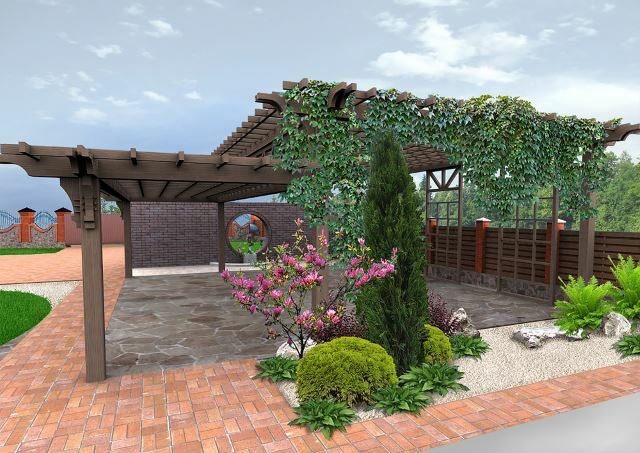 In this interesting design concept, the 3D rendering depicts a great covered patio area full of creeping vines and lush foliage. The area in the rendering is a large area, so if you are working with a smaller area you’d need to scale down, but this is a breathtaking design that would make any outdoor area beautiful. 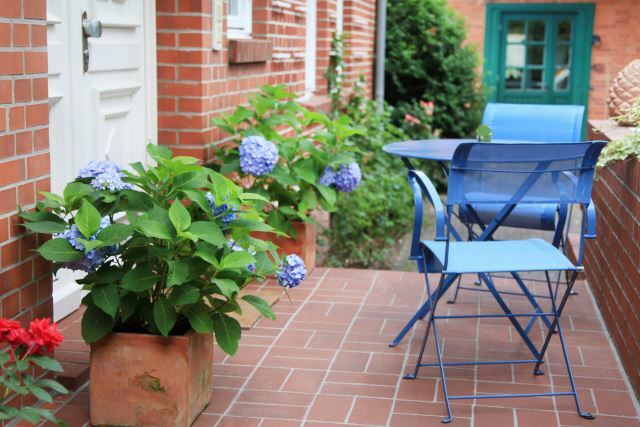 This is an adorable side house patio area that uses blue chairs to liven up the scene. Even though the patio area is obviously small, using interesting furniture such as these adorable blue chairs is a great way to add intrigue to even the smallest areas. The potted plants and surrounding foliage makes this the perfect nook for sipping on morning coffee while reading the newspaper or having lemonade with a friend for a mid-afternoon chat. These super cute flat, square bricks are various colors and will add so much character to an outdoor area. 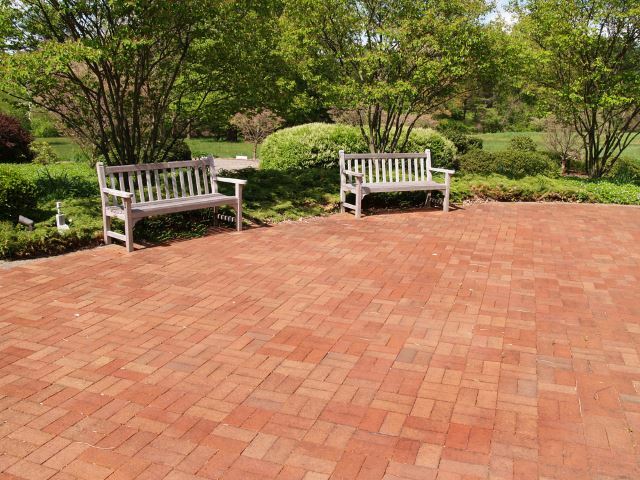 Whether it’s under a gazebo, under a garden birdbath or placed as an entire outdoor patio, these bricks demonstrate how easy it is to incorporate color and add so much depth to an area. This is only one color scheme out of thousands you can choose from. 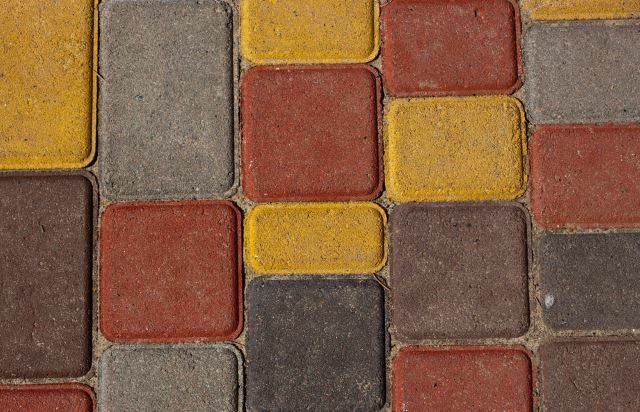 You just need to determine what the color scheme is and how large the space is that you need paving. 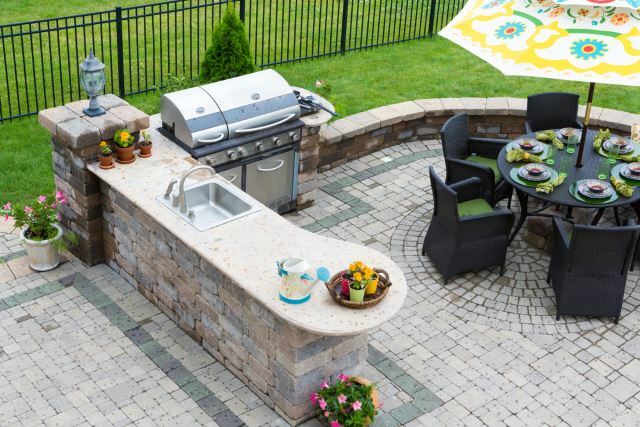 This patio and lawn combo is the perfect way to have the best of both worlds. Spruce up an outdoor area by paving it with bricks and adding fun outdoor furniture, but keep some of that natural element to the scene, as well. Especially in a setup like this where the grass is lush and green, you’d want to keep that element into the mix. Play around with the size to figure out how much of either element would be the better fit for your space. 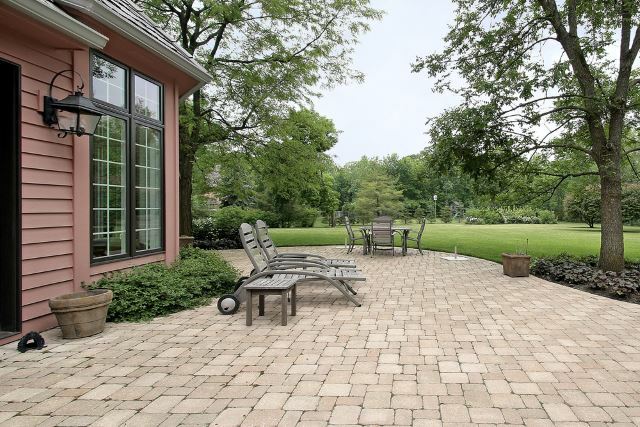 This large expanse features a traditional red brick patio with white grout. This was the customary patio you’d find in all kinds of homes across the country and still looks super great today. This is a relatively large patio design, but this kind of look can be executed in all types of outdoor areas. The trees in the photo provide lots of useful shade so the use of a gazebo or covered are isn’t’ necessary. You could, of course, still incorporate that into the mix if that’s what you prefer. 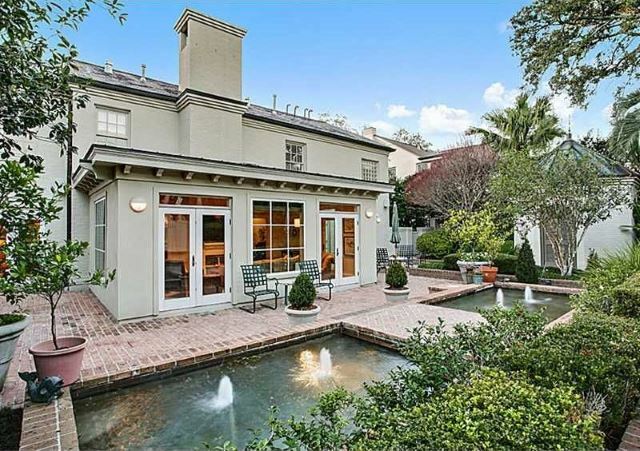 This is your classic New Orleans style scene that you’d find in larger estates across the state. 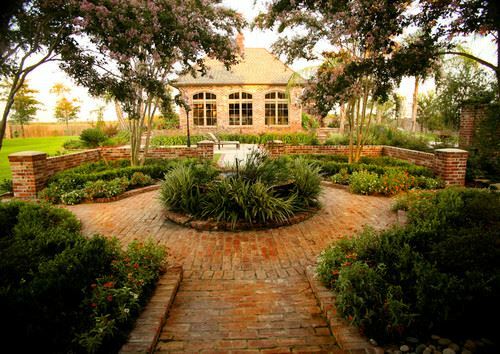 Lush gardens, classic brick and ornate statues are just some of the most common elements you’d find in a landscape idea like this one. The brick work in this setup is impressive in that it’s almost in all the elements mentioned. Bricks are featured in the garden area, the garden walls and even in the house in the background. 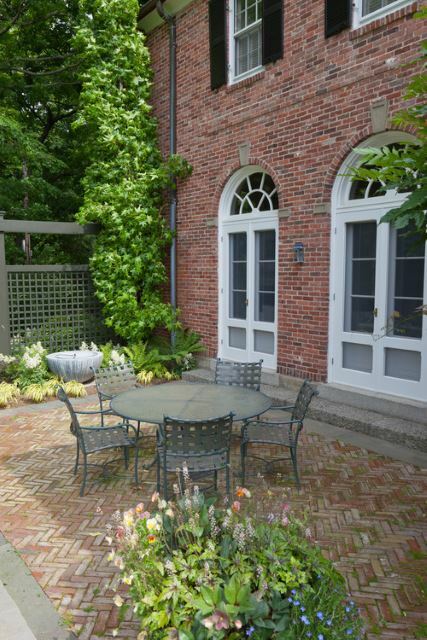 This patio almost looks like an outdoor bricked living room. This setup is unique because it is virtually all made of brick. You can’t even really tell where the floors and the walls begin since that same type of brick is used all throughout this scene. This is a great way to use that traditional brick work into a more contemporary scene that will leave guests under the impression you know how to really decorate a room. It’s elegant and completely unique. This is a great example on how to mix two of the greatest outdoor elements – a great backyard patio area and an impressive water feature. Square holes are cut into this patio area to give way to double water features that contain a double geyser style fountain. The scene is so elegant and having these great water elements is relaxing and peaceful. There’s just something about water features that bring so much elegance to a scene. 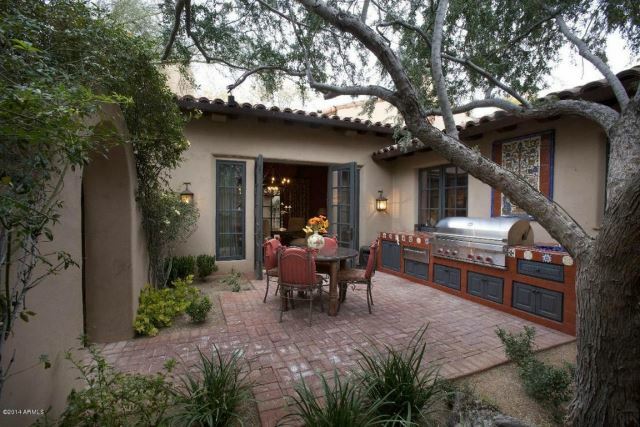 Channel all the elements of the Mediterranean with this great patio idea. Everything from the subdued brick work to the intricate wall art design makes this scene classic and interesting. Even though this particular patio area is a smaller one, the elements inside of it really add so much character to the scene making it appear larger than what it actually is. The brick work is fantastic without taking away from any of the subtle design elements. 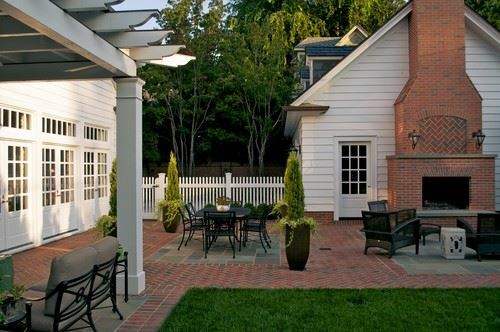 This gorgeous patio idea incorporates grass into the mix, as it’s almost acting as the grout in between brick designs. If you want a completely unique concept while keeping that traditional brick work look, this is a great concept to try out. Keeping the larger slab of brick under the covered area and letting that expand out into the actual yard makes the scene great, but what is truly eye catching is that great natural grass cutting right into the design. You’d need a really large space to be able to incorporate patio work with a pool, but if you’ve got it, flaunt it! This patio design features multi-colored bricks that have cut out throughout the design to add that extra interesting design layer. The pool looks great in the center of the scene with the decor circle around it, but it’s also nice that there is more to the whole patio area than the fact that there is a pool in it. There are a lot of intriguing elements in this design. 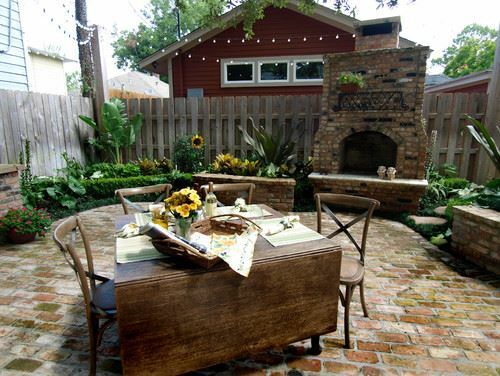 This is a great example on how to incorporate a brick patio area into a smaller outdoor area. 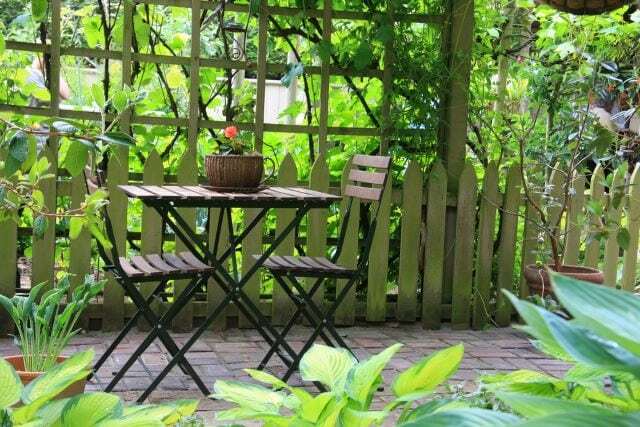 Virtually just a square, this patio is small but adorable. 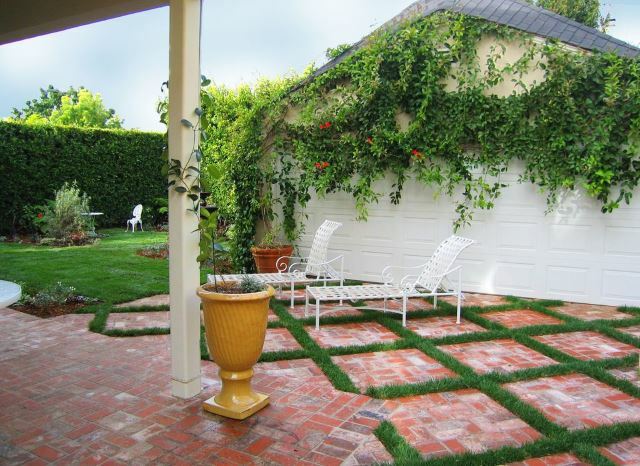 The natural grass acts as a barrier between the patio and the elements. This would be a great setup for a small picnic or a setup you’d find in a smaller suburban home that still wants to enjoy the outdoors every once in awhile. The table with umbrella adds character while serving a useful function. 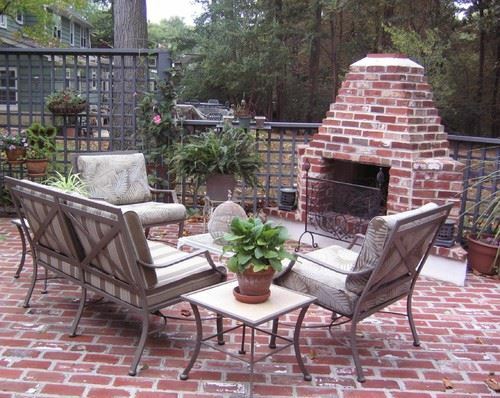 This patio design features so many different styles of brick. Colors, textures and designs are all intricately woven together to create this breathtaking patio scene that works on so many different levels. This would be a great setup for a larger home that wants to feature a cozy outdoor sitting area or a home that hosts many outdoor gatherings. Imagine some wedding décor in a scene like this? You could easily style this are up or down depending on the occasion. 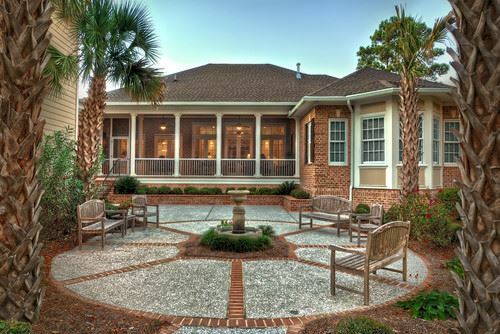 Like many traditional homes around the east coast area, you’ll find so many brick house with matching brick patios. This concept is no different in that it adheres to that classic east coast look while mixing it up with various brick work. The house brick is that gorgeous dark red and brown mix that makes any home look classy, while the patio area is the more subdued brown and gray scheme that adds character to the outdoor scene. Stoves just look better in brick. On this great patio, there is a brick oven specifically used for baking pizzas, but you know you don’t have to just use it for that. The scene is far too elegant not to use that over for multiple things. 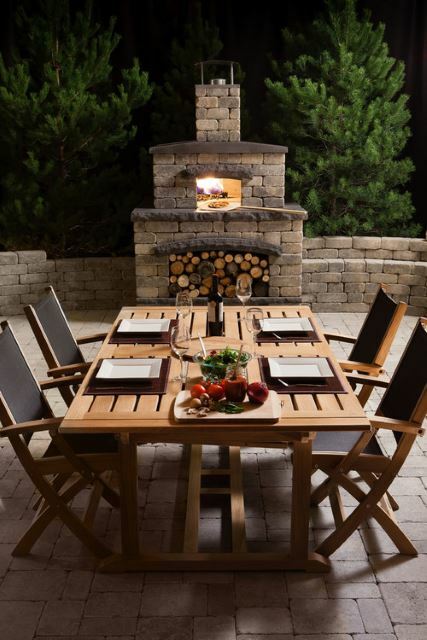 Not that pizza can’t be elegant, who doesn’t love a pizza date night, but this patio area offers so much more to it. It’s clean, gorgeous and the perfect setting for an intimate party with friends. There’s never too much of a good thing. That is truly evident in this great patio setup. Using the same style and cut of brick, this entire patio is comprised of the same style giving it a clean and interesting look. No need to be distracted by too many color schemes in this patio area. 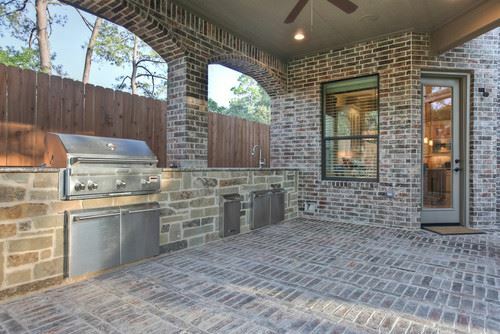 This brick is classy enough to stand on its own and make this outdoor kitchen area look superb. 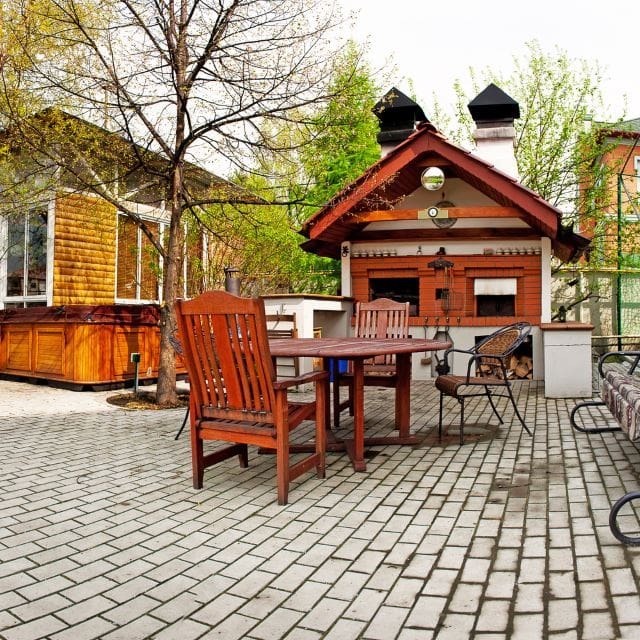 All this really takes is good strategy and planning, and of course, interesting outdoor kitchen elements. 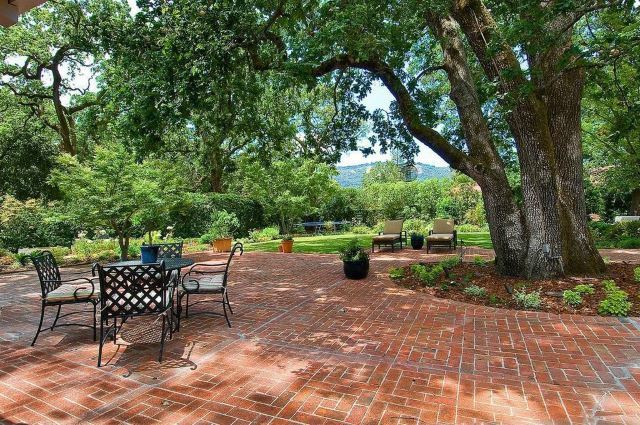 What’s better than a well-groomed brick patio area? 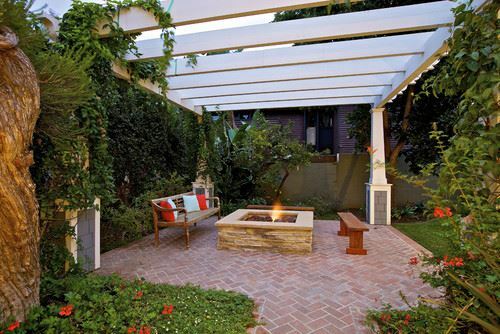 A well-groomed brick patio area with a fire pit right in the middle of it all. Pull up some great outdoor lawn chairs and you’ve got yourself the perfect setup for roasting marshmallows on a chilly winter night. The greenery in this scene really catches the eye, as well, since everything is fresh and in full bloom. The bright white slated cover makes the scene seem more contemporary and modern. The massive brick oven and the flooring are perfectly matched in this modern outdoor living space. Not just a backyard area, this scene will make anyone who visits feel as if the living room is in fact outside of your house. I can only imagine how inviting the inside of this estate looks since the outdoor setting is so comfy. This would be the perfect setup for a family that enjoys entertaining outdoors and has many, many friends. 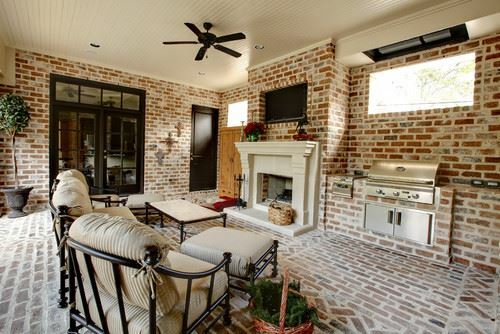 You don’t have to limit yourself on saving brick for a covered patio are only. 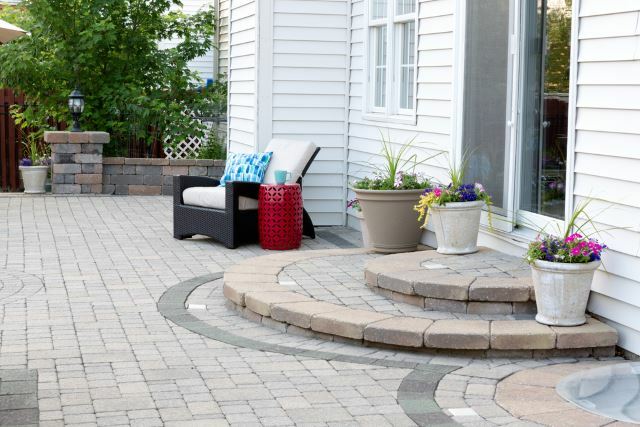 Use that great brick to create winding paths down into the garden or river’s edge. It’s a great way to promote adventure in your guests while making your entire outdoor scene look organized and clean. This is a great example on using a brick path to lead back up to a great patio area. The brick elements in the garden beds and pillar bases is also a nice touch and adds interesting texture. 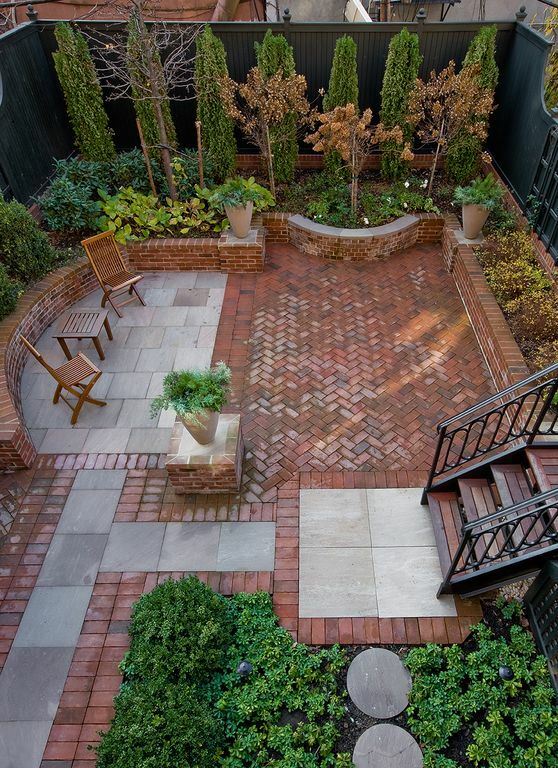 This outdoor area looks so organized mostly because of this great brick work. 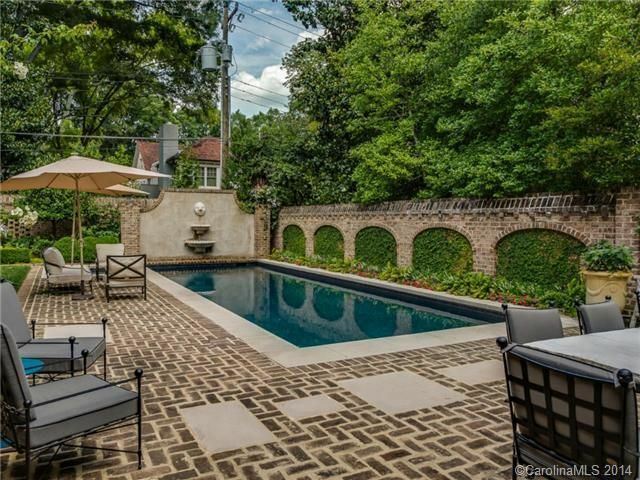 The smooth, tiled-style bricks are saved for the cute little patio area while the larger, textured bricks are used in the pool area to give this scene more depth. It’s a great way to add texture around a pool area since it’s important to have a floor that promotes grip. You wouldn’t want anyone slipping and falling near a pool area – that just wouldn’t be good news for anyone. So much great brick work to look at in this fantastic outdoor scene. 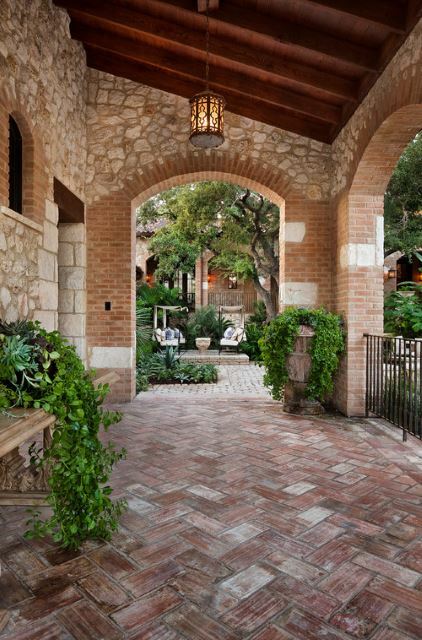 If it isn’t the intricate brick work in the flooring that catches your eye, then it has to be the texture in those great big brick arches along the covered patio area. This is an elegant scene that looks great and keeps everything interesting. This would look fantastic on a large estate or a lodge that has an intimate courtyard setting. Whatever its purpose, this area is beautiful. Add an interesting design to any outdoor area that only looks difficult by using creative patterns and colors. This relatively simple design looks far more complicated than it is because it’s so organized. The small water feature in the center of the design makes this sitting area cozy and more intriguing. You can scale this down for a smaller space or even make it larger if need be. The fact that it is set in a clearing makes it even more intriguing. 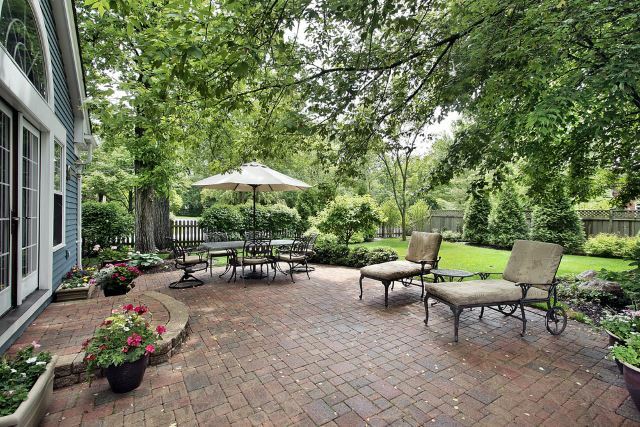 This is a gorgeous brick courtyard area that features intriguing patio furniture to match. A common theme within these brick patio design ideas, a fireplace is a fantastic element to bring people together in a sitting area. Of course, you’d need to plan a brick fireplace in an area where it gets cold enough to use it, as I can’t imagine a fireplace would be that enjoyable in places with hotter climates. The small embellishments such as the potted plants and lattice work make this scene extraordinary. Turn your patio into an outdoor bungalow by utilizing plenty deep, dark brown or black elements. Deeper and darker colors just make a scene seem more modern and unique. The dark brick in the outdoor oven and the deep, dark chocolate brown of the table make the eyes naturally move from the background to the foreground. The brick flooring used in this setup is a bit more subdued, which is better for these intriguing elements to stand out. This vivid brick truly cuts away from the norm. The blazingly blue sky almost imitates the vividness of the scene since it’s equally as bright. Using bright colors or themes will really open up a space and make it naturally intriguing. This scene is even more unique because it incorporates natural stone work into the mix by adding a trail of smooth, flat stones. This would be a great design idea for a home that appreciates the arts or is set near a riverbed or pond. A truly stunning scene! 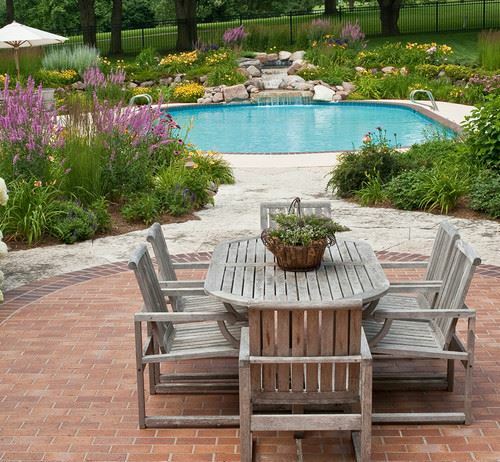 As you can see from this nifty roundup, there are so many great brick patio designs out there for you to choose from! You can either mimic an idea you’ve seen here in its entirety, or pick and choose the different elements that you liked and incorporate them into your own design. Either way, your outdoor space should be a reflection of your personality and home. It will be what you want it to be and if you apply necessary passion toward it, your guests will feel right at home. So what do you think you’ll try? Which one of these great designs stood out to you? Please comment and if you want to check out even more cool patio design ideas, click here!